Will EURO Gap be Filled? The euro exploded higher after centrist Emmanuel Macron “won” the first round of the French Presidential election. Of all the probable scenarios, this was the best outcome for the euro, which explains why EUR/USD gapped above 1.09 when the markets opened for trading on Sunday evening. Macron is pro euro, pro EU whereas Le Pen wants a referendum on EU membership shortly after her victory. Although investors are relieved about Macron’s victory, there has been very little follow through in the leading investors to wonder if the gap near 1.0730 will be filled. While it can be argued that we won’t know who the final winner will be for 2 more weeks, Macron has a very good chance of winning so there’s less need for investors to hedge against a Le Pen victory. The latest German IFO report also supports a stronger currency with the business confidence index rising to 112.9 from 112.4. However there are 2 big risks for the euro this week – the first is Thursday’s European Central Bank monetary policy announcement and the second is a tax reform announcement by U.S. President Trump on Wednesday. 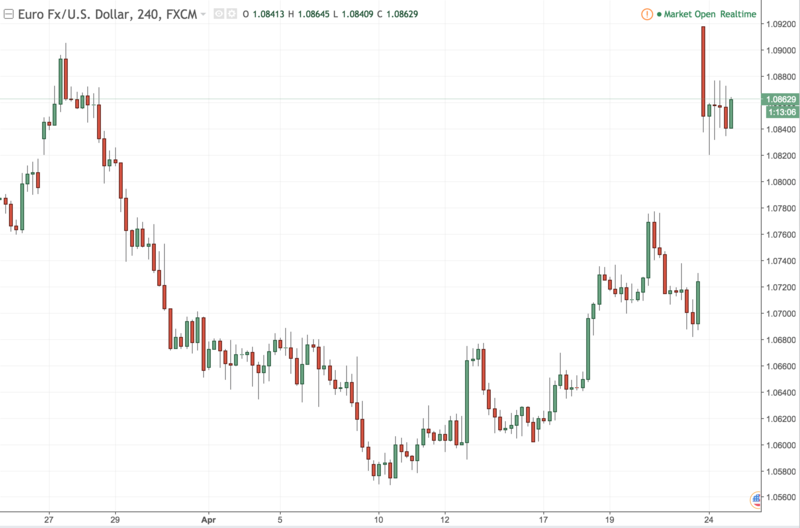 The central bank wants the market to understand that policy is accommodative and will remain so for the foreseeable future and if that is emphasized on Thursday, the euro could fill its gap quickly. President Trump is also set to make a big announcement on tax reform Wednesday and if he effectively convinces the market of his plans, the dollar could soar, sending EUR/USD lower. Technically, this 4 hour chart shows EUR/USD support at 1.0820. If it falls below 1.0820, its headed for 1.0730. However the longer it holds above 1.0820 and even 1.0840, the more bullish it is for the currency and the greater the chance of a move back above 1.09.